As SuperWendy’s TBR Challenge topic for this month is Series, I have decided to list a series of reading notes on romances and other reading that has been sitting on my TBR shelf for many months. Reading Note 1: Impulse Reading. There is too much impulse reading in the world. Just because a book is a new release, or has just hit the bestsellers list, this is no reason to dive straight into reading it. Sometimes, a book needs to wait. This is why I love SuperWendy’s TBR Challenge. I don’t think of books that have been on my TBR as languishing, as much as they are maturing while I get to them. There are many books that I have read long after their publishing date that have not aged well due to their time on the TBR, or due to the long wait until I have come to the end of a reservations list. I have become accustomed to waiting for books. As a librarian, I never feel that I can read a book that has reservations on it before the actual borrowers who have been waiting in line. This inevitably means that I need to wait until the reservation list diminishes (not a particularly easy thing). I also do not like the pressure of reading to a deadline. This also means that I miss the review flood, and I often find myself writing about books long after they have been released. The subsequent notes are all of books that have been waiting on my shelves, or that I have waited for patiently through library reservations. 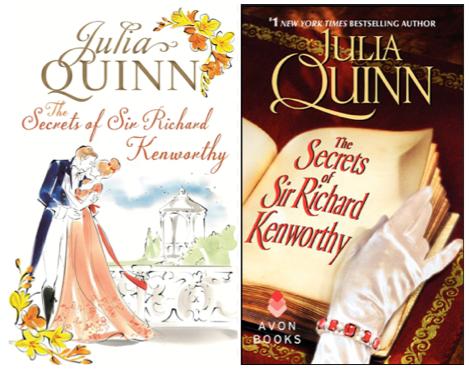 I took Julia Quinn’s The Secrets of Sir Richard Kenworthy to my bookclub meeting on the weekend and it caused a huge argument between myself and another member of the group. When she saw my book she was all: I can tell from the shape of the book that it is a throwaway read; there is nothing to learn from romance; You read it, it’s there, it’s fun but don’t try to tell me that it has the depths of Kundera etc, etc. I’m paraphrasing here. This was from a closecloseclose friend with whom I regularly argue on many issues that affect our lives. I also think she was deliberately riling me as she knows that I jump to the bait or as my dad would say Πεταγεσαι σαν πορδος απ᾽το βρακη/You jump like a fart from undies. It was fun seeing other people around us unsure as to how to react to our shouting. I won’t go into my response or her counter-responses here, (except to say – how can you judge a book purely by its shape? ‘Tis the content not the container!) however, I LOVE and ADORE that it was not the discussion of other reading choices but the reading of romance that brought shouting and dissension. There were fists being shaken to the skies and the thumping of tables and turned heads from all around. If we had white gloves with us, there would have been a duel challenge! The cafe owners, thankfully, did not intervene. Does it really matter which cover and shape I read? I don’t think enough people get riled up enough over books to have pistols-at-dawn moments. I think this is what I love about some reading arguments (both online and offline). People getting angry over books. People being incensed by what others read, how they read, and where they find meaning. I certainly get incredibly angry at marginalising reading interests, judgmental statements about people’s reading choices, at assumptions of people having a lesser intelligence either because they do not enjoy reading or cannot read, and my blood absolutely boils when reader shaming is bandied about. Every day and throughout the year, I spend a substantial amount of my time reading about reading. From scholarly articles to academic books to chronicles of reading and reading memoirs. I am going to post a series of short observations on the books (and the occasional articles) that I have been reading particularly reflecting on the presence (or lack thereof) of romance fiction, and on how I feel my perceptions of reading aline with the authors. So far the books I have discussed I found by browsing the library shelves at my university, whereas Catherine Sheldrick Ross’s The Pleasures of Reading led me to them. published by McGill-Queen’s University Press, 2011. © Vassiliki Veros and ShallowReader, 2012. Unauthorized use and/or duplication of this material without express and written permission from this blog’s author and/or owner is strictly prohibited. Excerpts and links may be used, provided that full and clear credit is given to Vassiliki Veros and ShallowReader with appropriate and specific direction to the original content. I do not accept Advanced Reader Copies or unsolicited review copies. All my reading choices are either personal purchases from a retailer or borrowed from a library. It has been a while….